Ncstar VDBSOLFLIP Vism SPD Flipdot Sight is equipped the KPM modular mount for mounting onto KeyMod, Weaver, Picatinny, M-LOK rails and slots. The VISM SPD Flip dot reflex sight lens can folds flat against the optic body when not in use and the folding lens can be quickly deployed with the press of the ambidextrous side levers. The Solar cells are mounted on top of the reflex sight and will power the red dot whenever there is sufficient sun light on the solar cells. The red dot automatically turns on, when there is sufficient sun light. The SPD FlipDot can also be powered by the onboard CR2032 battery. The battery should be used when there isn't enough sun light, when using the optics indoors, or when using the optic at night. 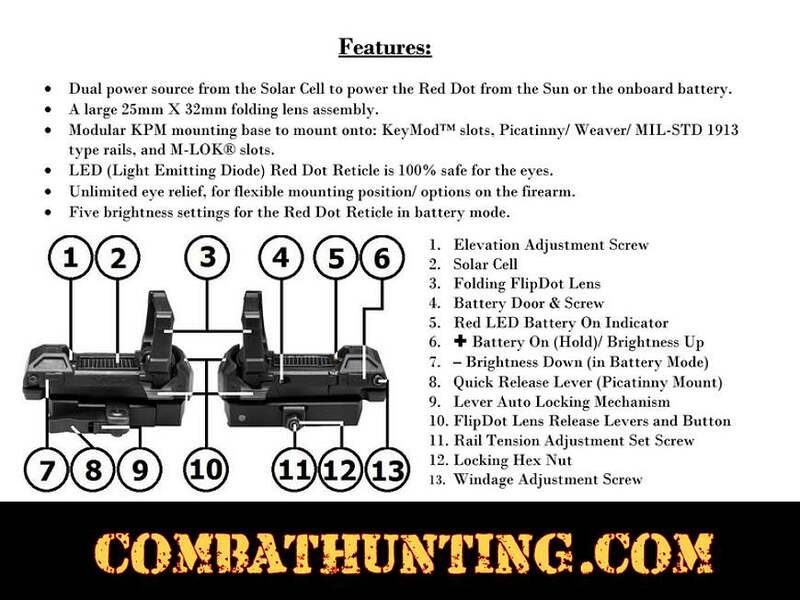 A red LED indicator on top of the optic by the solar cells will turn on when the red dot is powered by the battery. The FlipDot features side mounted + button to turn on the red dot under battery power mode. You can adjust the brightness level up or down when powered by the battery, via the side + & - buttons. The FlipDot is equipped the KPM modular mount for mounting onto KeyMod™/ Picatinny/ M-LOK™ rails and slots. Mounts onto rails with a quick release Picatinny mount. The Picatinny mount can also be removed to reveal the KeyMod™ and M-LOK™ base. Optic includes the KeyMod™ shoe an M-LOK™ compatible T-nut. US Patent Pending. Lifetime Limited Warranty. Fits KeyMod Slots Picatinny Weaver MIL-STD 1913 Rails and M-LOK Slots. Take a look at the VISM SPD Flipdot Reflex Sight in action this is a great video by Combathunting.com.